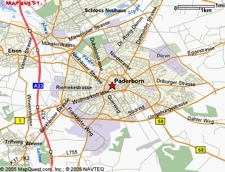 A cautionary tale of using hotspot guides by providers in Paderborn, Germany: For those of you who read German, a very funny short tale of someone visiting Paderborn for family reasons who, armed with a list of T-Mobile Germany hotspot locations, comes up empty again and again (and again). I have had the same experience with Belgacom and Swisscom Eurospot. In Europe, it's the operators who have been rolling out hotspots, not individuals. Here's my explanation for why Wi-Fi in Europe is so crappy: the operators don't want to make Wi-Fi popular because it will eat into their revenues so they make the experience as lousy as possible. They want people to hate Wi-Fi. Ganz lustig, aber nicht fuer Matthias. They have special rate plans for their DSL customers ala SBC and Verizon. I had more luck with a t-mobile hotspot at Starbucks Coffee House Potsdamer Arkaden last year. I'm amazed at how many more hotspots t-mobile.de has since last April. Could it be that we have "Potemkinsche hotspots" now instead of "Potemkinsche Doerfer" (villages). In the meantime - back in the U.S.A. - Catherine the Great (Zeta Jones) says: "Get more" - which is true for me. Of all the commercial hotspots I tried I find t-mobile the most reliable.